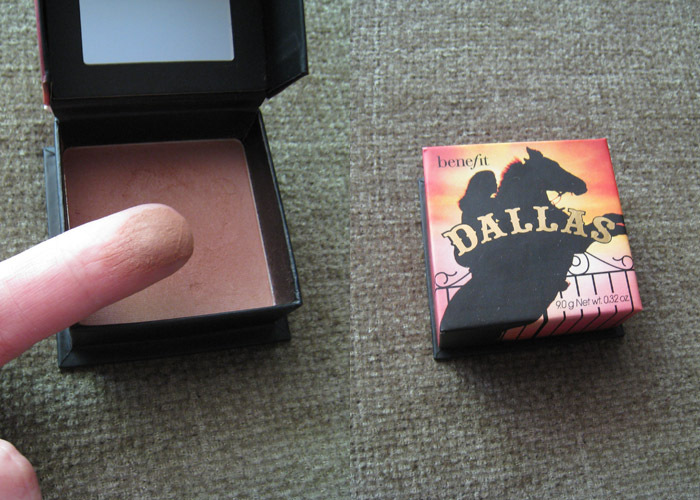 Benefit Hello Flawless is a powder foundation that I wanted to buy for a long time. I'm mostly a liquid foundation person but this summer I wanted to try a powder foundation, since I had bad luck with tinted moisturizers that I've tried the past summers and I cannot wear a liquid foundation with such warm weather, it seriously melts and transfers everywhere on my face, so a powder foundation was my last choice. I wasn't sure what powder foundation to buy, I didn't want to pay a lot since I am very prone to breakouts and I didn't want to choose a really expensive one and not being able to use it at all, so I decided to choose Mac's Studio Fix but I when saw that Sephora promo I changed my mind. I chose the shade "Me Vain?" Champagne and I have to say it's an amazing match for my NC25 skintone. I love the square compact, it has two layers, the first one is the powder and the second one is for the sponge and the brush it comes with. 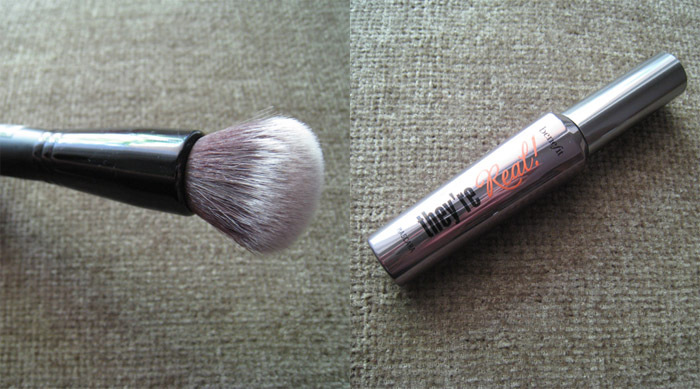 Now for the powder itself, I've already used it twice and I'm really and I mean really impressed!! It gives an amazing coverage without being cakey, it melts on the skin like a liquid foundation. I have oily skin but I have some dry patches and I was afraid that this powder would made my dry patches really visible but that didn't happen with this one. The thing that really impressed me the most was how long lasting it is even with really warm weather. Both of the times I've used it, the temperature was 30C, but this powder managed to stay on my face for more than 5 hours without transfering around my nose or my chin. This is not a full review for the powder foundation since I've only used it twice but it's my first impression, and I'm really pleased with it! My only complaint is that it costs 34 euros and it contains only 7 gr of product, while Mac's Studio Fix I think it costs around 30 euros for 15 gr of product. It's a very expensive powder foundation! Benefit Dallas blush, or face powder, I'm not so sure how exactly to call these Benefit powder boxes, is a bronzed plummish/rose blush that it can be also used as a bronzer. I was between this and Hoola bronzer but I chose this one since I can use it alone as a blush and bronzer together, and I have to say it's really pretty. It contains shimmers but they're not visible on my face, it just gives a soft sheen on my cheeks. Very pretty summery color, especially for warm skintones! Expensive blush, but it contains 9 gr, more than other blushes like Mac's for example. The Sephora Mineral Powder brush is a brush that I wanted to buy for a long time but it was always sold out everytime I was in a Sephora store. I went to two Sephora stores to find it but they didn't have it, so I waited and went to a different one and they had only 2 of them left! I can understand why they were always out of stock because it's a really good brush!! It's a small dense round kabuki type of brush without being too dense like Sigma's flat top kabuki brush. I've already used it with both liquid and powder foundations, and I like it with both. It gives almost the same results with the Sigma's F80 brush, maybe with a little less coverage at liquid foundations, maybe because it isn't a flat top kabuki but a round one, but nevertheless I love it!! Benefit They're Real mascara is a mascara that wanted to try since the day it was first released but I couldn't find a good promo to buy it, but with the 50% off it was a really good chance! But I haven't opened it yet, since Im already using my new Clinique High Impact mascara and I keep my mascaras only for 3 months before I toss them out. So I can't give you my first impressions about this product yet. And lastly I got a back up of Sephora's Waterproof eye makeup remover. 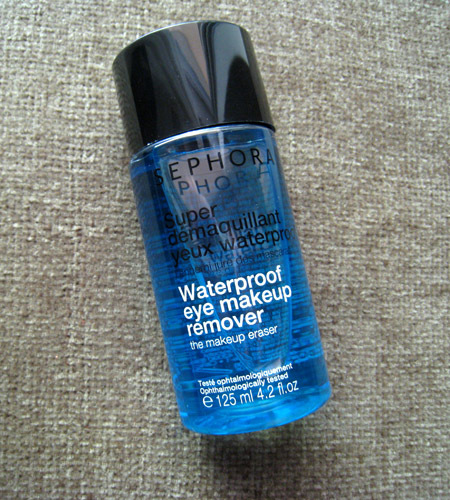 I find it to be a really good eye makeup remover, it doesn't take too long to remove my mascara. Some people find it to be too oily, but I don't mind being oily, even though the most oily eye makeup remover I've tried was Clinique's Take the Day Off for eyes. So tell me have you tried any of these products? Do you like them? And for my Greek followers, did you buy anything from the Sephora promos?? Σ'ευχαριστω! Ναι ηταν πολυ δυσκολο να το βρω! Οταν την ανοιξω κ την χρησιμοποιησω για λιγο καιρο, φυσικα κ θα κανω! Μόλις είδα τη φωτο του post σου γέλασα γιατι τα τρια απο τα προιοντα είναι κοινα με μενα! !Η πουδρα της Benefit την οποία χρησιμοποιώ και γω θεωρώ οτι είναι εκπληκτική, απο τις καλύτερες που εχω αγοράσει!! Η They are real εχει πλέον μόνιμη θέση στα καλλυντικά μου και είναι τέλεια και το πινέλο πολύ βολικό, το πήρα και γω οταν είχαν 50% μαζί με το φλατ καμπούκι και του κονσίλερ! Σύντομα θα ανεβάσω και γω τις αγορές μου απο τα sephora με 40% εκπτωση που είχαν!! Κυρίως Too faced επέλεξα και ηταν τόσο τέλειο που είχαν 40% εκπτωση!! Καλοφόρετα όλα!! Χαχαχα σ'ευχαριστω! Δεν ειναι τελεια η πουδρα?? Αληθεια λεω τωρα, ολο το καλοκαιρι αυτη θα βαζω κ νομιζω οτι απο δω κ περα θα εξερευνησω τα powder foundation λιγο παραπανω, καποια στιγμη θα παρω κ της Mac που ελεγα, ειναι πολυ καλη λυση με πολυ φυσικο αποτελεσμα! 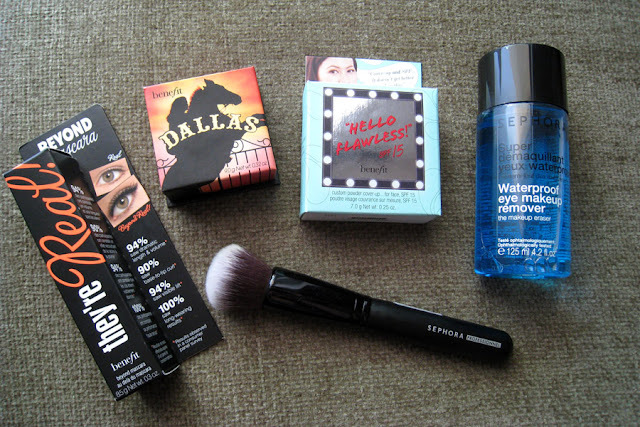 Βασικα ειμουν μεταξυ της Hello Flawless και της Amazing Face απο Too Faced, αλλα επελεξα της Benefit. Περιμενω το haul post σου! ax koritsi mou ego d exo sephora edo pou eimai kai mono pou skeftomai pos tha ta xrisopliroso trelainomai!! !kaloforeta poli oraies epiloges ekanes!!! auto to pinelo ton sephora to skeftomoun tooooooooooosoooooo kairo na to paro gia make up kai d tolmousa na kano tin kinisi !!!! ma ti xazi!!!! tha einai i proti mou agora molis pao thessaloniki! Ναι παρτο ειναι παρα πολυ καλο!! Nice haul! I'm slapping myself for not taking advantage of the 40% sales! Don't worry I;m pretty sure they wll do one again, they just realise that they are not going to sell any products from these brands unless they start doing discounts!! LOL Thanks!! Yeah go and get it!!! Με γεια σου!!! ομολογω ζηλεψα γιατι ειναι ολα οσα πηρες τελεια! Θα ηθελα πολυυυ να δοκιμασω το πινελακι.. Σ'ευχαριστω!!! Ναι ειναι πολυ ωραιο να το δοκιμασεις!! It's also perfect for powder foundation because it makes the powder melts onto my skin and doesn't look powdery at all!! I'll try using it with cream blush also, I only have 1 from Mac. You've got a blog award! I really, really want to get that Sephora brush. I'm so gutted I missed that sale, hope there's gonna me more offers like this in the near future!